Faversham is the only town in the UK to use the Royal arms of England as its own heraldic emblem. Full-colour representations of them can be seen on the Guildhall in the Market Place, the Alexander Centre (former Municipal Offices) in Preston Street, and Forbes Road railway bridge. In heraldic terms they feature gules, three gold lions passant gaurdant - in plain English, on a red background three gold lions with their right forepaws raised and their heads facing the viewer. They reproduce the reverse of the former Borough of Faversham's second Common Seal, thought to date from the reign of Edward I (1272-1307). Round the arms on the seal is the Latin inscription “Regis ut arma rego libera portus ego” - in English, “Since I [Faversham} bear arms for the King without charge, I am a free port”. This suggests that in return for the town's services to the King, he granted it the privilege of using his Royal arms, without variation, as its own. This is a reference to the town's corporate membership, as a ‘limb' (associated port) of Dover, of the Confederation of Cinque Ports. There was no Royal Navy till the 16th century; and the terms of this membership were that Faversham should provide a ship or ships when required for the defence of the realm and in return should be outside the jurisdiction of the county of Kent, and enjoy many privileges, not least a degree of autonomy comparable to that of the Hanseatic Ports in continental Europe. Edward I may also have been mindful of the fact that Faversham had long Royal associations, having been described as “oppidum regis” (the King's town) as early as 811. Perhaps, too, his advisers were aware that in the Saxon period the town seems to have served as a capital (alternative to Canterbury) of the then independent Kingdom of Kent. The evidence for this, discovered in the 1850s, was the large cemetery, with rich finds of jewellery, which occupied part of the town's Kings' Field. The Royal Arms of England took their present form in the 1189-1199 reign of Richard I (Richard the Lionhearted), the three lions (sometimes described as leopards) being said to represent England, Normandy and Aquitaine, the three realms of which he was monarch - his empire stretched from the Scottish borders to the Pyrhenees. In the 18th century the Royal arms of England (as also the arms of Faversham) were used on the reverse of tokens issued by local traders when there was a national shortage of small change. In 1933 it was noted by a heraldry expert that no grant of arms to the then Borough of Faversham had survived in the official records - hardly surprising, as these do not go back to the 13th century. 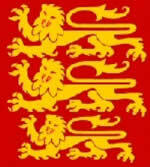 However, he cited a 1619 source that suggested that the three lions' hind-quarters should be in silver, not gold. In 1988 the Borough's successor, the Town Council, sought resolution of the conflict between this version and the earlier one with the College of Arms. The outcome was that in 1990 the College confirmed the later version. However, when surrounded with its proud Latin inscription “Regis ut arma rego libera portus ego”, the earlier version also remains in use. In 2001 to establish a distinctive identity for the town for marketing and similar purposes the Town Council adopted the logo seen above. The lion refers to Faversham's coat of arms; and the motto 'Market Town of Kings' to the fact that as well as having been identified as 'The King's Town' in 811, Faversham has been visited by many monarchs and has the longest-established market in Kent, going back to before 1086.